I love this time of year in the Northern hemisphere: as the wind grows cooler and the leaves become tinged with the colors of warmth, the Crock pot reappears on my counter, diffusing the scent of spice and delight into the air. One year ago I was in the middle of my elimination cleanse. After a lifetime of eating a gluten and sugar-rich diet, I constructed my cleanse over the course of a year. Gentle makes sense to me, when dealing with an issue as sensitive as what we eat. Everything we ingest goes through the process by which our cells are built – they regenerate, on average, every seven years. This regeneration process is constant, and the very fabric of our bodies – the cells- are fed by the nutrients extracted from what we eat. And so, changing our diet, means we are changing ourselves. This metamorphosis requires much support. In September of 2014 I eliminated practically everything from my diet, including: gluten, sugar, processed foods of any kind- only whole foods were allowed, meaning only ingredient lists of one ingredient. Recipes such as the one offered here, were allowed, because they were homemade using whole ingredients -no store bought sauces or spice blends. Soups felt like life-savers. The healing properties in this soup fortified my weakened small intestine and made me stronger than I have been in many, many years. Allergies, autoimmune conditions, fatigue and thyroid disorders will all be pacified when the gut is strong. Thus, this soup is a powerhouse of healing. 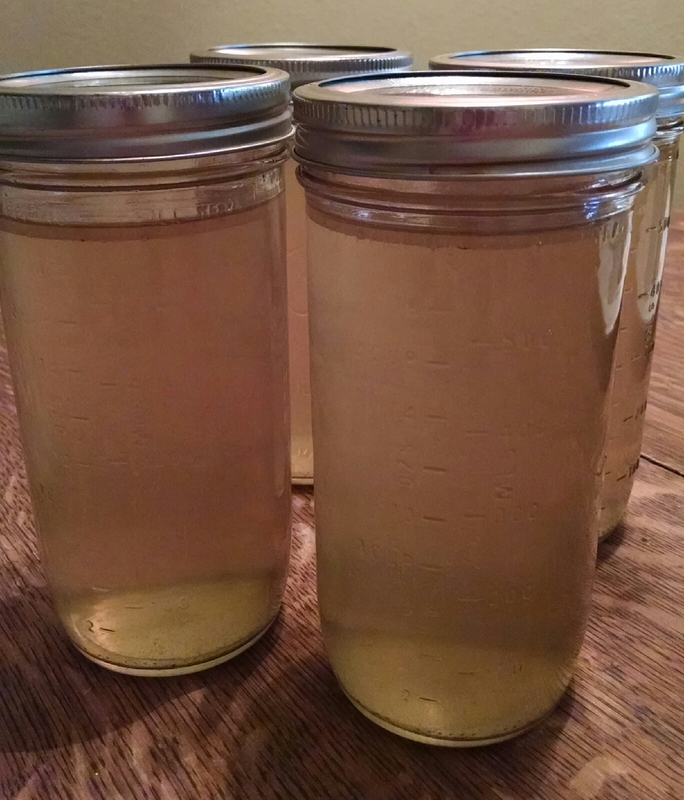 Using homemade bone broth for the stock is where you get the deepest healing value. Slow cooking animal bones extracts minerals that are rejuvenating for our digestive system, cells, and connective tissue. The collagen in the broth literally heals us, from the inside out. 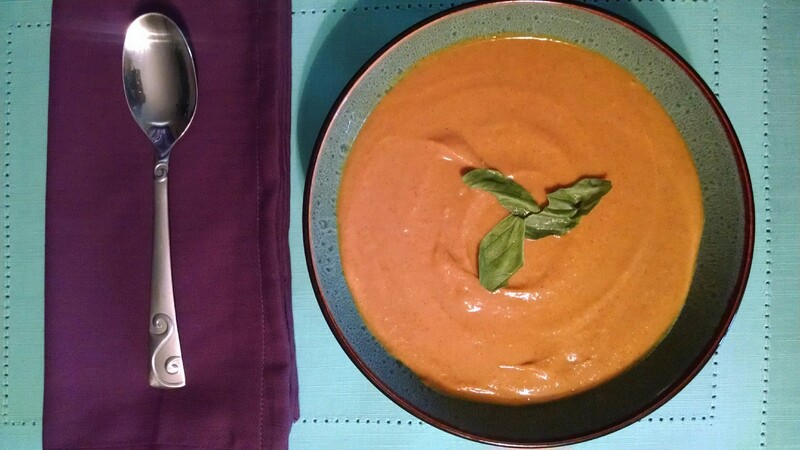 So, put your music on, light your scented candle and savor the Autumn season with this healing soup. Heat oven to 350. Place bones on a glass baking dish and bake them for 30 minutes to extract flavor. Place roasted bones into a large soup pot. Pour water over the bones. Add the apple cider vinegar – this helps extract the minerals from the bones. Bring pot to a boil. After five minutes of boiling, turn the heat to low and add salt. Allow the bones to cook on low for around 20 hours. You can also use a Crock pot for this process. Peel and cube the squash. Steam the squash until easily pierced with a fork. Meanwhile, cut onions into long slices. Warm ghee in a frying pan (cast iron is the best) and add the turmeric. Warm the ghee and turmeric over a low heat, stirring. When they are blended into a paste, add the onions. Cook onions on low until they are translucent and soft. Place the softened squash, the onions and the broth into a food processor or high-powered blender and puree until smooth. Place this puree into a Crock pot. Add coconut milk, cinnamon and salt and mix well. Simmer the soup on low for three or four hours. The past couple of years have been transformational. In January of 2014 I was diagnosed with the autoimmune condition, Hashimoto’s thyroiditis. This diagnosis came as quite a shock. 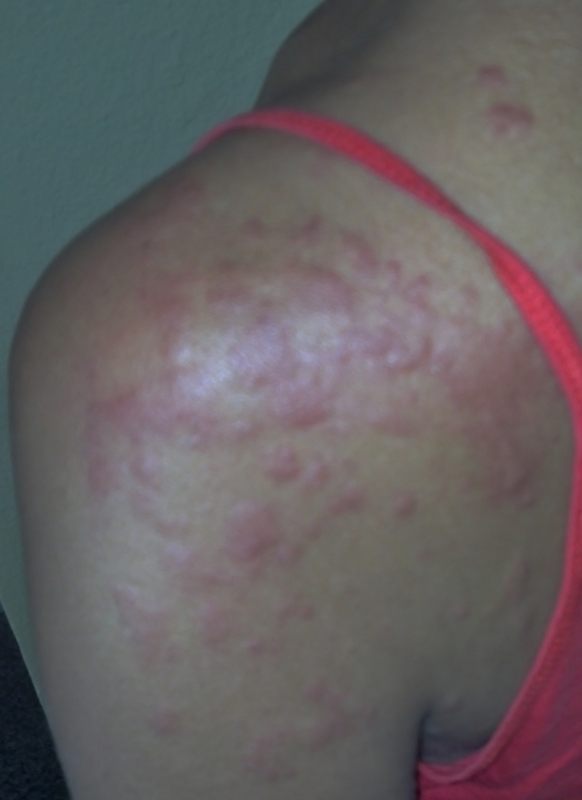 The frustrating part was that, even after following my doctor’s advice perfectly, by August of 2014, I was still dealing with the daily hives that had plagued my life for over a year. These red welts appeared all over my skin in the morning – every single day. This picture of my shoulder gives you an idea of what they looked like. They would pop up on different places on my skin. The worst was when they covered my neck, those grew the most inflamed and the feeling was most uncomfortable. The hives would slowly subside after I took a Benadryl, only to make a comeback in the afternoon or evening. And no one had any answers aside from ‘take more Benadryl’. It was like an unsolvable mystery. This was a very challenging experience. I felt like I had no understanding of my own body, like it was betraying me. Normally in life, if someone betrays us, we leave them. But how do you leave your own body? You don’t. Prior to all this, I had been a very healthy and happy person. But, red welts all over your skin every day are a sure road to lack of energy (I’m positive the Benadryl was not helping in this department) and depression. I refused to accept this life. Empowering myself with knowledge about how my body actually works has been a fascinating journey. I had to reach deep into myself to find the energy to continue learning, and believing that I could affect my own health. Even though I was exhausted from the hives, Benadryl and autoimmunity, and at times I felt like I was drowning, I just kept swimming up, toward the light. As I learned how the body works and how it can break down, I added layers of healing into my daily practice. After a year and a half of this swimming upward, I feel as though I have plunged through the surface and the sun shines on my face – finally. I am not drowning. I am stronger than ever. And the journey continues – my passion for learning about the body has only grown. Implementing my new knowledge has lead me to a place of true health and vitality. I feel better today, at forty-years old, than I have since I was in my mid-twenties. It is amazing how life unfolds. I never expected that this would happen to me. This experience has deepened me, and I am grateful for it. However, for the first eight months after the diagnosis, I did NOT feel grateful! During those months I felt lost and betrayed by my own body. Depression settled over me as I considered the fact that I may be declining into worse and worse health, since doctors say that one autoimmune disorder often leads to others. But then, in September 2014, a miracle occurred. The culmination of the work I had been doing since I had been diagnosed was reached. I had been sugar and processed food-free for nine months, gluten-free for four, and dairy-free for three. I did a 30 day hiatus from red wine (something I typically drink a couple of times a week). I ate whole, organic foods and drank my bone broth (see previous post for recipe and description). I practiced meditation and positive affirmations. Halfway through September, my hives disappeared. One morning I woke up with a feeling of freedom. No red welts. Over the next few weeks the feeling of freedom blossomed. The hives were totally gone. I felt healthy – for the first time in over a year. With all the books and articles I have read, and online seminars on autoimmunity I have attended, I now have a clear understanding of how my healing occurred. The picture has grown clearer and clearer. I will continue to explain this phenomena, and others related to health, on this blog. I am a pretty private person, and it is somewhat difficult for me to share all of this. It’s just that lately, I have been feeling that through sharing what I went through, I may somehow serve. In a world where many people are suffering, it is time to lift one another up in encouragement. It is time to share our stories and together, move toward healing. After eliminating various key players from my diet, including sugar, gluten and dairy, I was no stranger to will power and cleansing. But, what really saved the day and eradicated the daily hives, had nothing to do with denying myself anything. Instead, it had to do with adding something. For me, true healing came down to the bone broth. I know that cleansing prepared my body to receive – to reap the benefits of the broth. But the step in my year to heal that made the biggest difference in how I felt (and looked) was this simple soup. I always found it so silly that when someone was ill, the neighbors brought warmed Campbell’s soup. I never liked that stuff and I strongly doubted its ability to heal anything. I was right – it doesn’t. But the idea behind this custom is solid, and comes from a distant time when canned soup was not yet a reality. If one wanted broth, one made it from scratch. Homemade bone broth soup is a powerhouse of healing. For real. I had eaten what I called ‘the mermaid diet’ for twenty years – no meat, except wild-caught fish, vegetables – and lots of gluten. For some reason, I never questioned the gluten, even though now that I think about it, a virtual mermaid would not be eating french bread. But, I saw it as an innocuous food substance that didn’t require questioning. Bread, bagels, pasta – I took them all as just part of being alive. Turns out, eating gluten in every meal was not helping – it was actually harming my intestinal tract. But that’s another post. The point here is that since I ate no meat, there were important amino acids that my body was missing. The beauty part is I still don’t have to chew steak if I don’t want to (I don’t know why the thought horrifies me). I do have to be very aware of getting enough protein. I eat nuts, seeds, salmon and avocados often. I have also added eggs to the roster. But, the tonifying and strengthening aspects of meat, I can drink. On a Winter’s day, a hot mug of steamy bone broth has replaced my afternoon coffee, and my entire body has thanked me. In a past post I discussed the phenomena of intestinal permeability – or the ‘leaky guy’, and how this condition contributes to autoimmunity and allergies. This is where bone broth comes in and saves the day, just like a super hero. The elements in the bone broth actually heal the intestinal wall. The collagen fortifies the all-important barrier between your GI tract and your bloodstream. Your GI tract hosts many things from the outside world, from food to bacteria to dust – and when functioning right, your intestinal wall kicks out the bad guests, right down through the colon and out. But, when it is NOT functioning at its best, this wall lets junk into your blood. Not good, right? Enter bone broth. Time to fortify that wall. Time to strengthen, from the inside out. My hives have gone, never to return. This alone feels like a miracle. They left during the 30 day period I spent last September, eating NO sugar whatsoever, and drinking PLENTY of bone broth. This was no coincidence. I feel stronger, with more energy. The easily digestible amino acids and Vitamin B that is found in the broth gave my body just what it had been looking for – for years. My skin glows. I am forty years old, yet my skin has taken on a youthful glow, since starting the broth. And, if you don’t like the flavor, don’t worry. You can hide the broth in sauces, soups or stews. Come to find out, fine French cuisine calls for bone broth to make most of its sauces. How do I make mine, you may ask. Easy. 1. Buy quality grass-fed beef bones. Marrow bones are fabulous. 2. Roast a few bones in the oven at 400, to bring out a yummy flavor. 3. Place bones in large soup pot and cover with a generous amount of filtered water. 5. Let it sit without heat for a half hour. The vinegar will begin to pull minerals from the bones. 6. Add lots of garlic cloves, a few halved onions, sea salt and ground black pepper. Bring to a boil for a couple of minutes. 7. Turn the heat to low, cover and let it simmer for 30 hours. Yep, 30. 8. Strain the broth through a wire mesh, into mason jars. 9. Keep in fridge for a week, heating some up as needed. 10. Drink or cook with it, and watch yourself grow younger before your eyes. I will soon post some recipes I have created, using the broth. Cheers!